Hillel's environments can be seen as "ephemeral monuments" that elicit an active engagement with our personal and collective memories. The Lullabies installation is an example of how the artist employs the raw materials of History and transforms them into mimetic devices for the spectator. Television and other media are usually associated with an immediate perception, reducing the event to the “instant” of its information. Here technology is employed to question our habits and accepted truths, and to establish an active dialogue between past and present. Hillel’s environments can be seen as “ephemeral monuments” that elicit an active engagement with our personal and collective memories. Lullabies is the title of the environment in the Schwartzsche Villa Art Gallery in the Berlin district of Steglitz. 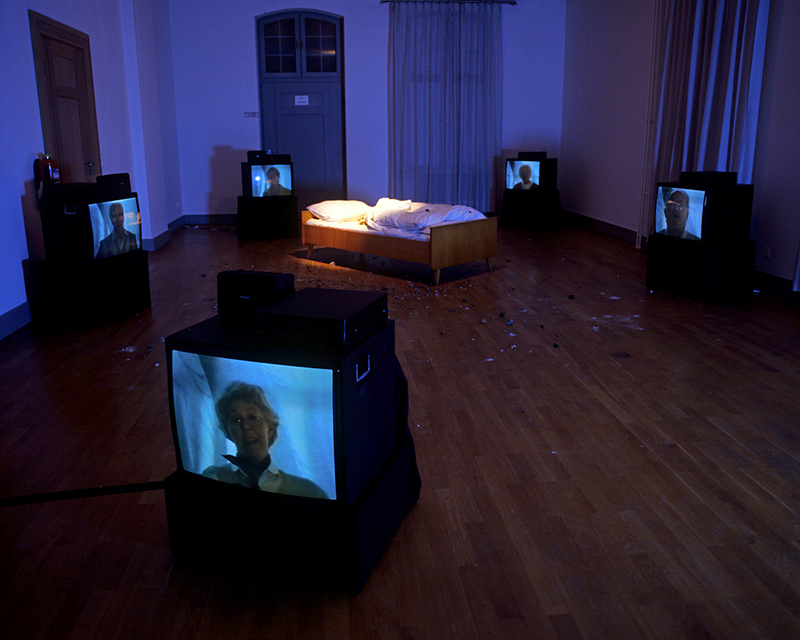 A darkened room with television screens, a bed in the center. Behind it is a second, lighter room with a pillar on which portraits are placed. At first glance the connection between the two works is not immediately evident. We see and hear eight women and men, who sing lullabies and tell about the lullabies of their childhoods. A loop, staggered in time, on six monitors, the sound becoming clearer as one approaches each screen. Standing still in the room, one perceives the songs and words of a backdrop of sound that also resembles a lullaby. Most of us are familiar with the songs; they have outlived many decades and lay buried in our subconscious. The video recordings break the nostalgic mood, the soft stillness, into which we would like to revert. Old people who sing lullabies and search for the right words have more of a disturbing effect. We sense that we pay more attention to their hesitation, their annoyance, their toilsome search for texts and melodies, than to the harmony of the familiar. The bed with traces of soot and dust does not invite the visitor to lie down. The other room is dedicated to Kurt Piehl. At fifteen in Dortmund he joined the “Edelweiss Pirates”, a network of resistance groups and cliques made up primarily of working class youth against the National Socialist regime. Kurt Piehl survived. 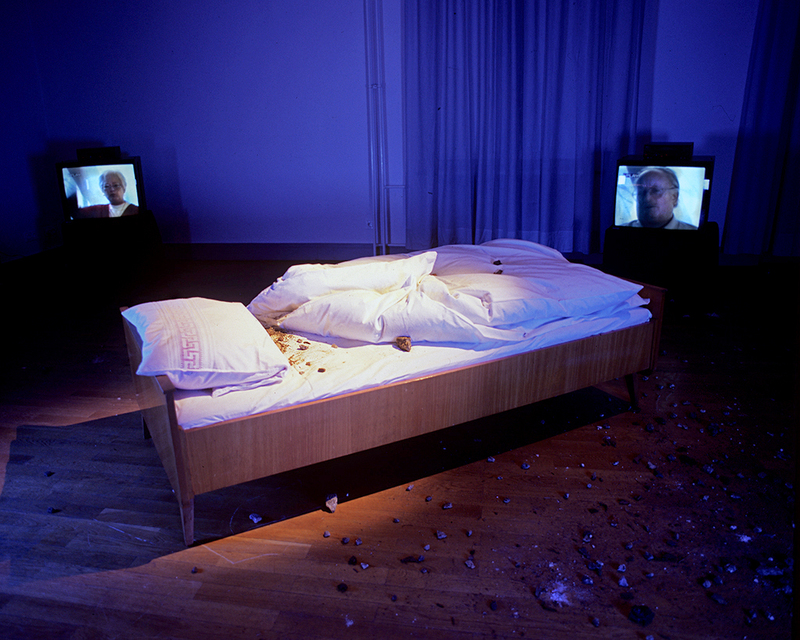 We see his face as it is today—enlarged clippings and sequences, alienated photos held on monitors and tableaus. We learn little about his life and his previous activities. The monitors do not contain moving images; they act as frame–like structures. They are stacked on top of one another in three groups of three on a pedestal, and arranged with the title Totem. The room is still. Two spaces with a leap through time. Disparate memories without any connection? The lullaby in the everyday life of National Socialism as the embodiment of a world intact and free of fear. Or the longing for such a world, especially in times of political and racial imprisonment and persecution and the bombing of cities. The resistance of the so called "little people" in everyday National Socialism: recognized and remembered only decades later, mostly because of citizens’ initiatives, today a part of the official culture of remembrance, yet mostly forgotten in any concrete sense. Two sides of the same history. On the one side the other is always missing. Two completely different forms of memory that cannot be reconciled with one another. Two artistic attempts to make us aware of this fact. Both installations sharpen our capacity to perceive overtones. What has faded out in one instance has left painful impressions in another. Precisely because the terror of National Socialism was not the topic of the lullaby interviews, the question of how much of this other part of history remains held in memory stands unanswered. 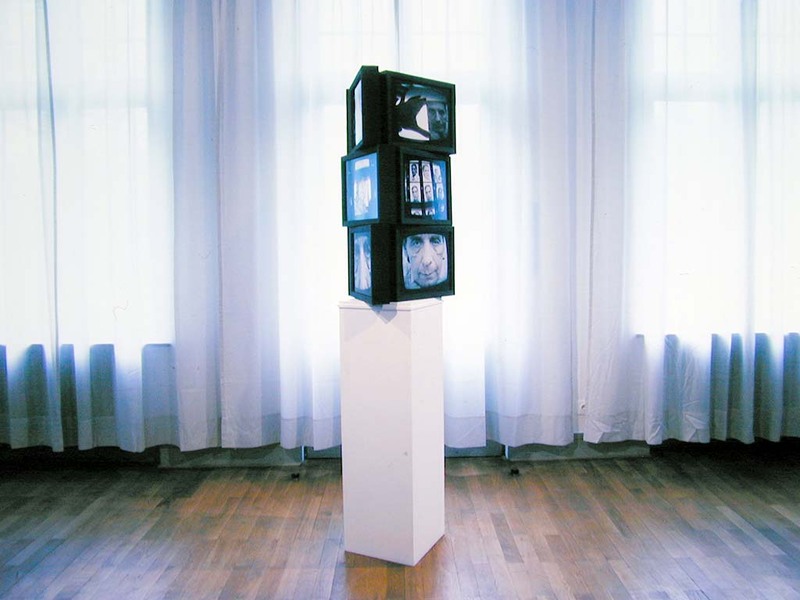 And using the pillar as a traditional sculptural form of ritualized memory for Kurt Piehl’s portrait sequence composed of monitors seems to lead nowhere; our desire to understand the past remains unfulfilled. Which types of memory are alive? The narrative? The symbolic? What do we, as creatures of consumption, conditioned by television and well informed about the Spielberg Foundation's Shoah Project, expect from eyewitness accounts? How do archaically timeless and puzzling modes of memory embodied in the pillar with the title Totem fit with the monitor as a symbol of the information age and the media-formed society? What do we remember and what do we forget? How does the community deal with survivors of persecution? When does memory become ideology? How do public and private consciousness regard one another? What relationship exists between everyday memory and the elements of memorialization? How much of each enters the “cultural consciousness?” In what ways do both mirror reality? How have the methods of working through these themes developed throughout the last few decades? Hillel’s work is not a sociological or cultural study; it is an artistic approximation. By its own aesthetic means it zeros in on some central questions of the current discussion on memory and commemoration. The treatment of conversation and portraiture in photography and video, the application of extreme wide angle and splicing techniques, the multistage use of video recording, TV reproduction, re-recording and reproduction of vaulted and broken-up images, and the related processes of transformation and distortion of image construction, body language and pantomime: all aim toward the perception of fragmentation and confusion, of the unspoken and the repressed. In this way all of our attempts at appropriating reality from then and now by facing it head–on–that is, through identification, empathy, simulation—slip into a calculated distance. The Schwartzsche Villa, the site of the Lullabies, is the cultural center in Steglitz, a district of the “good citizen”. Traditions of German nationalism pervade this area, and it was a particular stronghold for National Socialism. A few steps away, in a street called Unter den Eichen (“under the oaks”), where today the Federal Bureau of Construction stands, a memorial plaque reminds the visitor that the organizational headquarters for the economic exploitation of the “Elimination Through Work” program shared this space with the SS Central Office for Economic Administration. A few steps in the other direction, at Hermann-Ehbers-Platz, is the Wall of Mirrors, a memorial for the former Haus Wolfenstein Synagogue. At one time this project inspired a great deal of political controversy, as most district representatives were against its realization. The Steglitz Bureau of Culture has cultivated the examination of the era of National Socialism for many years now; with Lullabies its exhibition rooms have become a virtual space for remembering and memory, where concrete time and space are disturbingly compressed and transformed.